Many of the tabs you select from the Side Navigation bar at left will contain a series of sub tabs. These sub tabs are located in the right pane of the screen and directly relate to whichever tab you have selected at left. In the screen shot below, we have selected the Main tab from the Side Navigation bar. You can see that the Main tab is broken down into many more sub tabs (for instance, Property, highlighed in yellow), each storing pertinent information regarding the property. The Main tab of the Properties screen contains a host of valuable property information related to the property you have selected. 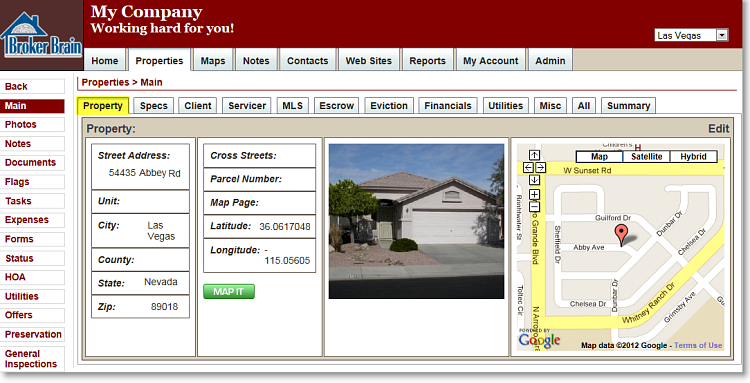 The information shown in the following screen shot relates to the Property sub tab. As you begin to work with Broker Brain, you will likely refer to the Main tab often, so you will want to take some time to browse through each sub tab and become acquainted with the information that is stored within each. 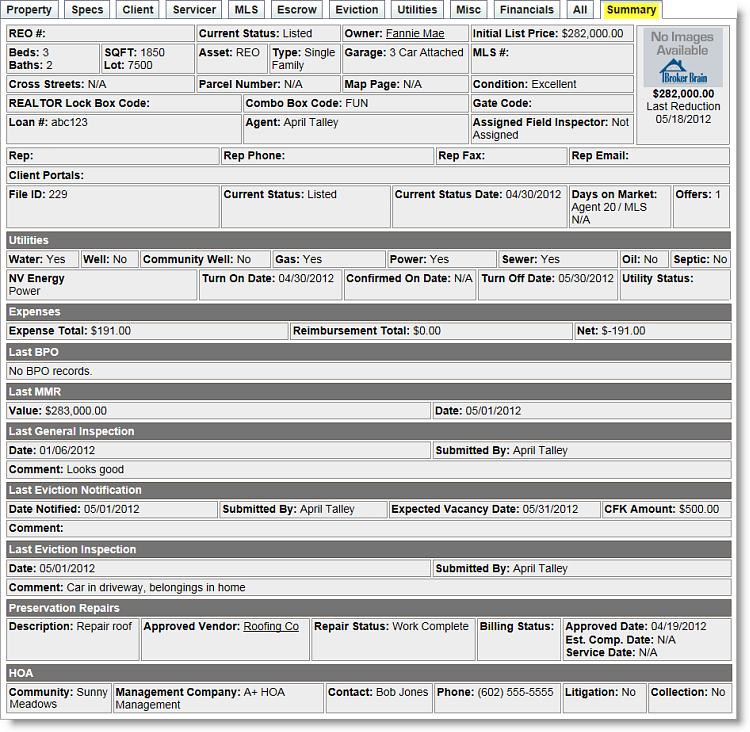 The Summary sub tab (shown highlighted below) is a useful tool for quickly viewing a broad range of information on a property. From this tab you can view information on property specs, utilities, expenses, BPO, MMR, General Inspection, Eviction Notifications, Preservation Repairs, and HOA. Note: This tab is especially useful for quickly locating repair status on preservations. By reviewing the Preservation Repairs section (located near the bottom of the screen), you can quickly determine whether repairs have been approved and current status of all preservations on a property.